Blue Cross Flags from 1918 and 1920. In 1920, the crown in the coat of arms in the 1918 version of the state flag was removed by a government decision. Finland did not have an official flag when the country became independent. The “Blue Cross Flag” was adopted as the official flag of Finland on 28 May 1918 by decision of the Finnish parliament. It replaced the temporary state flag with the heraldic lion on red background. 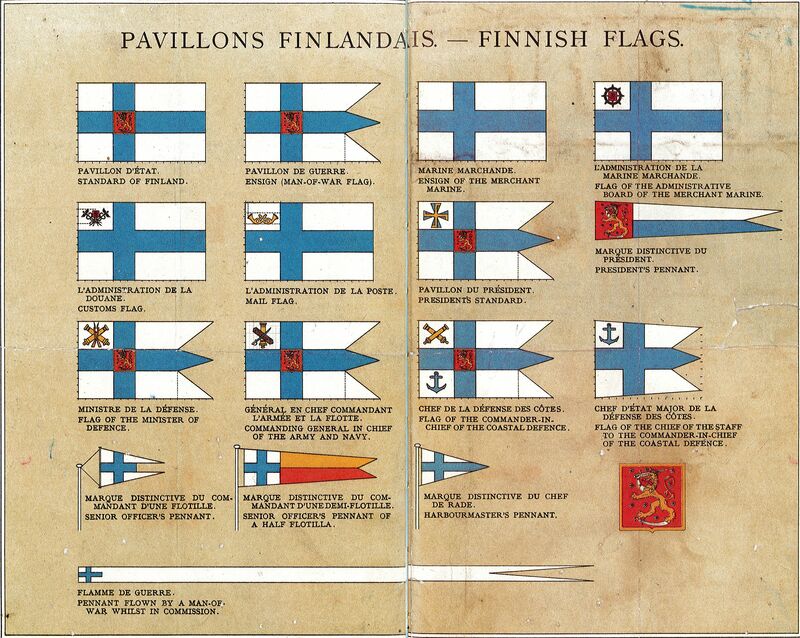 The Act on the Finnish Flag, endorsed by the Senate on 29 May 1918, defined the official state flag as a “rectangular garment with a sea blue (ultramarine) cross on white background.” At the centre of the cross there is the Finnish red-and-yellow lion coat of arms. The maritime and merchant flag was the state flag without the coat of arms. The war flag was the state flag with three points. The flag was designed by Eero Snellman and Bruno Tuukkanen. The crown was removed from the coat of arms in the state flag in 1920. The Act on the Finnish Flag was one of the first laws discussed in the parliament in May 1918 after the civil war. A majority of the parliament felt that the lion flag, which had red as its background colour, was not suitable for a Finnish state flag. The lion flag was supported by the MPs of the Swedish People’s Party and some of the representatives of the Young Finnish Party. Adding the red-and-yellow lion coat of arms to the state flag was a concession to them. During the civil war, the Whites had flown both the lion flag and different blue-and-white flags in parades and funerals. In areas controlled by the People’s Delegation, red flags were flown. Standards of labour unions and local trade union branches were flown at funerals of Red casualties. Various blue-and-white alternatives had been proposed already during the Russian rule. The blue and white colours became established during the 1860s in parallel with the lion flag. The Fennomans, who advocated for the strengthening of the position of the Finnish language, committed themselves politically to the blue and white colours. In its critics’ view, the blue cross reminded too much of the blue and white flags of different yacht clubs. Immediately after Finland became independent, the state authorities, municipalities and non-socialist organisations started to fly the Blue Cross Flag during festivities. Private citizens began to fly the flag from the late 1920s on. The Olympic Games increased people’s awareness of the Blue Cross Flag both in Finland and internationally. Hannes Kolehmainen, who won the Olympic Marathon in Antwerp, received a Blue Cross Flag on his shoulders, which was exceptional in an age that emphasised the solemnity and holiness of the flag. The flag was made more known as it was decoratively used in various advertisements and packagings. Paavo Nurmi was depicted running against the backdrop of the Blue Cross Flag in a Karl Fazer confectionery box cover. The use of the flag in adverts was respectful. Increased visibility made the Blue Cross Flag gradually part of the Finnish imagery. The political left’s reception of the Blue Cross Flag was initially strictly negative. The Finnish Social Democratic Party softened its position in the 1920s and accepted, for example, that the flag should be flown on Independence Day on 6 December. On the festivities of the “White Finland” the party took a negative stance and many of its members shunned the Blue Cross Flag to begin with. The communists in independent Finland were absolutely against the Blue Cross Flag. The aversion of the working class towards the Blue Cross Flag was increased by the compulsory flying of the flag at workers’ halls in the early years of independence. In as late as 1933, supporters of the nationalist Patriotic People’s Movement (IKL) flew the Finnish flag at over a hundred workers’ halls on 16 May, on the 15th anniversary of the end of the civil war. Initially, there were only two official flag days: Independence Day on 6 December and the Army Flag Day celebrated on 16 May to commemorate the Victory Parade of the War of Independence. Midsummer Day became the Day of the Finnish Flag first unofficially in 1927 and then officially in 1934. In addition, it was recommended to fly the flag on the birthday of J. L. Runeberg (5 February) and J. V. Snellman (12 May). On the day of Kalevala, 28 February, the flags were at the same time flown in Elias Lönnrot’s honour. Finnish-speaking students in particular worked hard to make Aleksis Kivi’s birthday (10 October) a national flag day, which finally happened in the 1930s. Flying the flag on Mother’s Day – which has been celebrated in Finland since 1918 – also became an established custom. Flag days sparked controversial feelings in different social circles. J. L. Runeberg was too “Swedish” for many Finnish-speaking people. On the other hand, Aleksis Kivi and Elias Lönnrot were strangers to a large part of the Swedish-speaking population. In principle, J. V. Snellman was the person who best united Finns. However, much to the annoyance of other groups, the Fennomans appropriated the Snellman celebrations. The less than enthusiastic attitude of the Swedish-speaking people to the Blue Cross Flag was apparent in the coastal regions of Ostrobothnia where people flew red and yellow colours alongside the official flag. The Blue Cross Flag was repeated in many ways in the war-time imagery. Great numbers of small national flags, sold by Finnish Lottas, were waved eagerly at the Finnish-Swedish-German athletics competition in September 1940. In the early stages of the Continuation War, people repeatedly got to see images of Blue Cross Flags being returned to the areas lost in the Winter War. The hoisting of the Finnish war flag on top of the tower of Vyborg castle at the end of August 1941 was a deeply symbolic event. After the war, even the communists marched behind the Blue Cross Flag in their May Day marches. The idea of the nation and what it encompassed was being redefined. By accepting the Blue Cross Flag the communists were declaring that they represented the people and worked for the good of the people. The lion flag – The red lion flag, which had become a symbol of Finland during the Russification period, was independent Finland’s first flag. “Maamme”, composed by Fredrik Pacius to the words of Johan Ludvig Runeberg’s poem written in the late 1840s, reached the position of Finnish national anthem during the 19th century. The position of the song was strengthened by the established custom of performing it at the end of patriotic events and celebrations. There is no law on the national anthem of Finland and no official discussion on the national anthem took place when Finland became independent. J. L. Runeberg wrote the original Swedish poem (“Vårt land”) in 1846. Fredrik Pacius composed the music in 1848 for the student celebrations of the Day of the Flower on 13 May. Runeberg’s lyrics were included in his book, The Tales of Ensign Stål, published in 1848, as the first poem of the first part of the book. Sheet music was included in the book as a separate attachment. Matti Klinge has pointed out that the premiere of “Maamme” at the Day of the Flower celebrations was motivated by a desire to take the celebrations in a politically safe direction. In Europe’s great revolutionary year, 1848, the students were ready to sing revolutionary songs to the tune of “La Marseillaise”, but from Finland’s point of view it was more prudent to sing about the Fatherland and declare allegiance to the Emperor. On their way to the Kumtähti field in Helsinki, the students sang “Maamme” several times with the accompaniment of the Guards Band. The song became a new symbol of the nation that was just emerging and gradually became a national anthem. The Finnish-language words to “Maamme” were written in 1889 by Paavo Cajander. The first translation of the song was included in the Finnish translation of The Tales of Ensign Stål from 1867. Cajander’s translation is very close to the earlier translation. The position of the national anthem before the 1890s was far from indisputable, especially among the Finnish-speaking population. From the end of the 1860s, the song was also sung in Finnish on patriotic occasions. Uusi Suometar newspaper reported in November 1869 of children from Ilmajoki orphanage singing “Maamme”, the national anthem of Finland, at a gala function. “Maamme” has gradually established its position as the national anthem of Finland. There is no law on the national anthem of Finland in the same way as the flag and coat of arms of Finland are described in their respective laws. In 2004, to honour the 200th anniversary of the birth of J. L. Runeberg, the parliamentary group of the Swedish People’s Party made a legislative initiative to have the position of “Maamme” as the national anthem confirmed by law. In the early 2000s, it was also proposed that “Maamme” should be replaced by “Finlandia”. This has been discussed since the 1920s. “Maamme” has eleven verses, of which usually only the first and last are sung. The national anthem of Estonia, “Mu isamaa, mu õnn ja rõõm”, written by Johann Voldemar Jannsen, is also sung to the melody of "Maamme”. The song became known in Estonia in 1869 at the first Estonian Song Festival. In the Estonian version, however, the last four lines of each verse are not repeated. The national anthem of the Livonians, “Min izāmō”, is also sung to the melody of “Maamme”. Independent Finland’s coat of arms was the lion arms that originated from the 16th century. It had been used during the Swedish rule to symbolise the parts of the kingdom east of the Gulf of Bothnia. When Finland became part of the Russian empire in 1809, the coat of arms was adopted as the emblem of the Grand Duchy of Finland. The crown was removed from the coat of arms in 1920 by decision of the Council of State. The first known rendition of the Finnish lion coat of arms is from 1583 and can be seen on king Gustavus Vasa’s tomb in Uppsala Cathedral. As a heraldic symbol, the lion has been well used in European coats of arms. The lion motif is also repeated in the coats of arms of Norway, Sweden and Denmark. The lion in Gustavus Vasa’s burial monument is rampant, trampling on a sabre with two hindpaws, and has a single-ended tail. 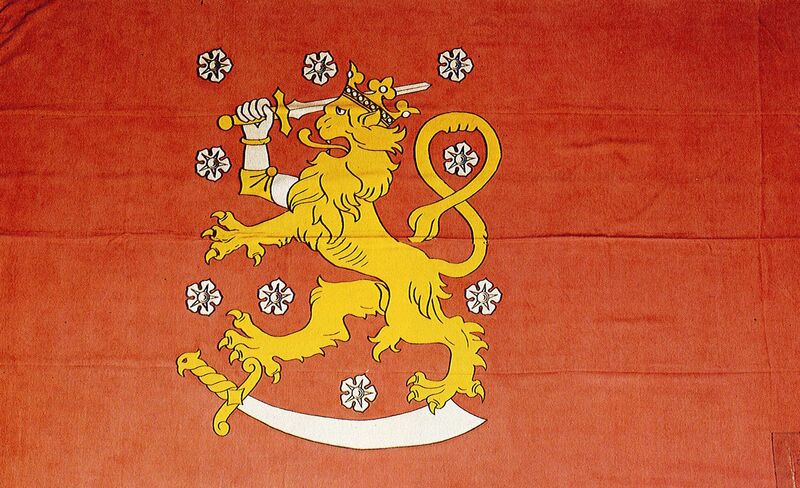 During Swedish rule, the heraldic lion stood on the sabre with three paws. It brandishes a sword in its right forepaw and has a double-ended tail. The first version of the coat of arms of the Grand Duchy of Finland based on this model already existed when Alexander I met the representatives of the Finnish Estates in Porvoo in 1809. Until the 1860s, the coat of arms was almost exclusively used as a Finnish symbol. The crown in the upper part of the coat of arms was replaced by the Grand Ducal crown. Until the mid-1880s, Finnish stamps depicted a lion standing on three paws. The lion became rampant once again as State Archivist K. A. Bomansson outlined and lithographer Ferdinand Tilgman carried out the Grand Duchy of Finland’s coat of arms in 1886. This lion figure quickly became common in coats of arms and lion flags made in Finland. Also the lion depicted on stamps adopted the new form. Russification eradicated the lion coat of arms from stamps and postcards. In stamps, the two-headed eagle began to be used alongside the lion after the 1891 postal manifesto. Finns, however, used mainly stamps with the lion. From the year 1900 onwards, the Post Office was not allowed to receive mail that had the Finnish coat of arms printed on it. In postcards, the lion was replaced by provincial emblems. The use of lion-themed stamps was completely banned on 14 January 1901. During the late years of the Russian rule, the Finnish coat of arms was included both in the lesser (1883) and greater (1882) imperial coat of arms. In the lesser coat of arms, nine regions of the Empire with imperial status are placed in the wings of the two-headed eagle. In the greater version (1882), the imperial Russian two-headed eagle is additionally surrounded by the coat of arms of six minor regions of the Empire. The lion in the Finnish coat of arms included in the imperial Russian coat of arms is standing on three legs. After the independence, the Finnish lion coat of arms maintained its position as the emblem of the newly-independent state. However, the coat of arms was slightly modified. The State Seal Committee did not consider the coat of arms designed by K. A. Bomansson in 1886 to be completely successful, but deemed it to be less powerful than the coat of arms on Gustavus Vasa’s tomb. The latter was used as a model by Erik O. W. Ehrström, who designed the new coat of arms. The Grand Ducal crown remained in the new coat of arms. It was removed by decision of the Council of State in 1920. In 1934, the government set up a committee to design a complete coat of arms for the republic. In a sketch drawn by artist G. Paaer, the lion coat of arms is supported by two bears standing on a base of spruce twigs. The proposal also included the motto vapaa, vankka, vakaa (free, firm, steadfast). However, the project progressed slowly and was forgotten in the war years. On a red field, a crowned lion, the right forepaw replaced with an armoured hand brandishing a sword, trampling on a saber with the hindpaws, the lion, crowned and armed, the weapons hilted and the armour garnished gold, the blades and the armour silver, the field strewn with nine roses of silver. The debate on the state flag was triggered in the 1860s when the situation in Finland improved and social reforms got under way. 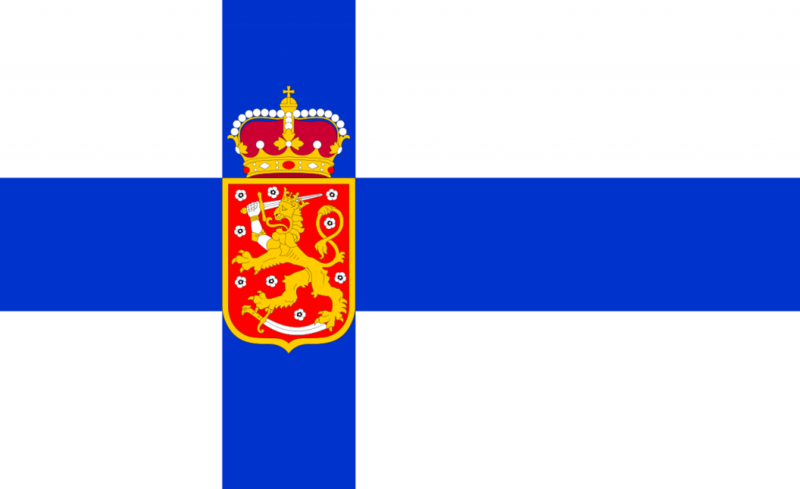 The lion flag based on Finland’s coat of arms was one of the candidates proposed. Fredrik Nylander, the Medical Officer of the City of Oulu, proposed in 1862 that the Finnish flag should display a lion on a red background. 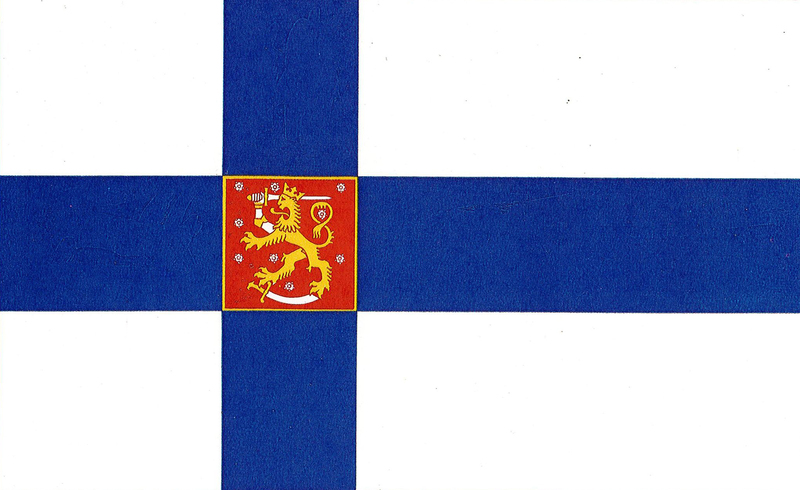 By the end of the 19th century, the lion flag had been established as a semi-official emblem of Finland. 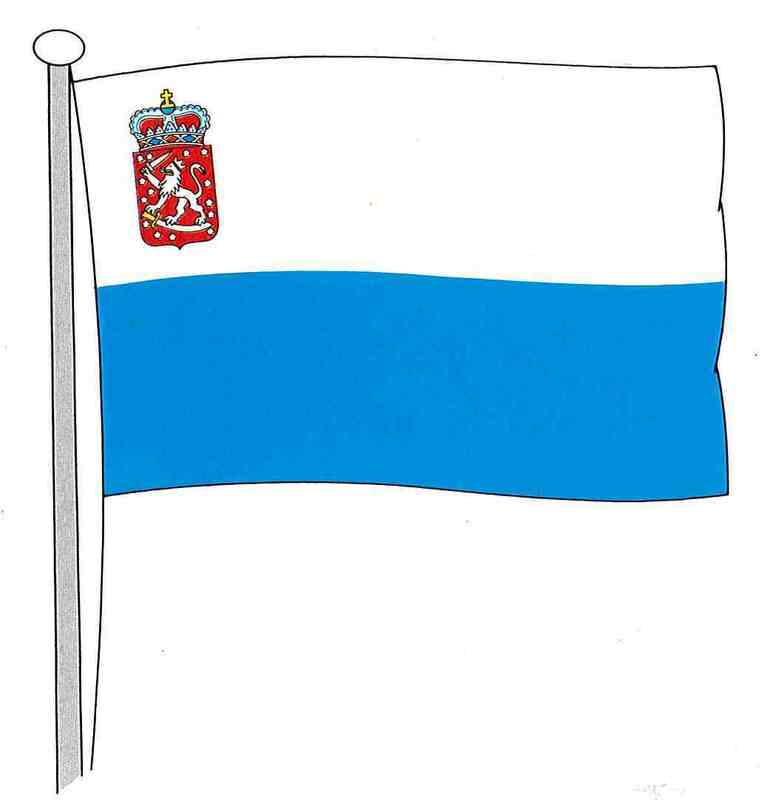 A blue and white flag designed by Zachris Topelius for a regatta sailed in Marstrand, Sweden, in 1862 was also widely used. 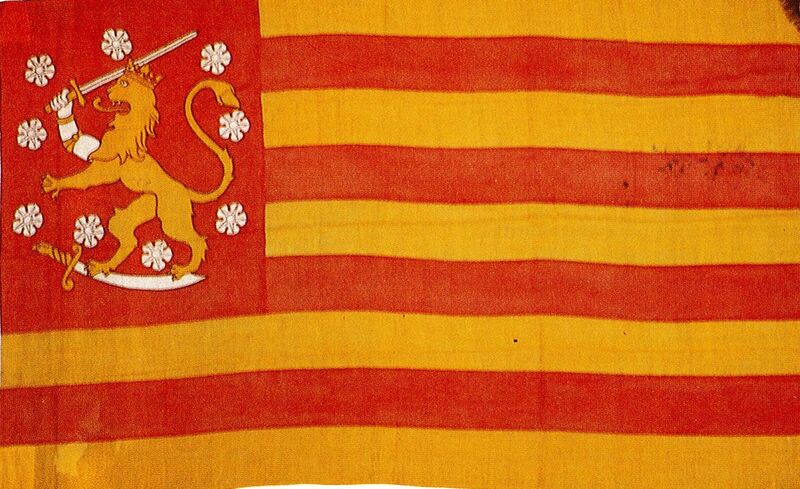 The Marstrand flag was divided into a blue bottom field and white upper field containing the lion coat of arms. Topelius actively promoted the blue and white combination. Other blue-and-white and red-and-yellow combinations were also used. In terms of late 19th century language politics, the blue and white colours were associated with Fennomans and the red and yellow with the Swedish-speaking population, although in practice, the division was not quite as clear-cut as that. Russia banned the use of all Finnish flags at public events in 1896, which strenghtened the position of the lion flag and Marstrand flag. The 1899 February Manifesto enhanced the status of the lion flag. The flag became a symbol of legality and the Finnish state. Members of the Young Finnish Party and Swedish-speaking population supported the red and yellow combination. The Old Finnish Party preferred the blue and white combination. The lion flag also received some international exposure. Before the Stockholm Olympic Games, the city’s largest department store NK commissioned a batch of miniature lion flags to be sold to spectators. After the 1917 March revolution in Russia, the lion flag superseded the Russian tricolour. The popularity of the flag as a symbol of liberty was at its highest. In addition, organisations and private citizens flew various blue-and-white or red-and-yellow flags. On 5 January 1918, the Senate proposed to the parliament that the lion flag should be made the official state flag. The discussion on the flag issue was still ongoing when the civil war broke out at the end of January. It became evident that the majority of MPs did not consider the lion flag to be suitable for a state flag. However, the parliament did not reach a decision on the matter before the civil war broke out at the end of January in 1918.